UNB is pleased to announce that Dr. Attila Komjathy, a principal investigator and senior member of the technical staff at California Institute of Technology’s Jet Propulsion Laboratory in Pasadena, California, has been appointed an adjunct professor in the department of geodesy and geomatics engineering at UNB Fredericton. Dr. Komjathy is a world-leading expert on geoscience applications of GPS. His latest achievement has been to use GPS to track the progress of tsunamis via ionospheric perturbations. 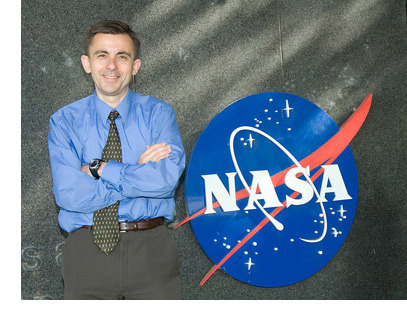 He has received a number of awards for his work including one for exceptional scientific and technical contributions from NASA's Inventions and Contributions Board and most recently, he was given one of NASA's Major Space Act Awards for his significant scientific contribution to the space activity of NASA. One of his main research goals is use GPS technology to detect ionospheric signatures caused by tsunamis in real time so people in affected areas may be alerted before a tsunami reaches them. Other uses of this technology include detecting earthquakes, volcanic eruptions, and meteor and nuclear explosions in even isolated places using GPS. A UNB alumnus, Dr. Komjathy is proud to now play an even bigger role at UNB and says he wouldn’t be where he is today if it weren’t for the mentorship he received while studying in the department of geodesy and geomatics engineering. "I was lucky to learn from the best," said Dr. Komjathy. "If it weren't for the mentorship and encouragement from the UNB researchers I was fortunate to work with, most notably Professor Richard Langley, I don't think I would be where I am today." Under Dr. Langley, Dr. Komjathy was awarded the Governor General's Gold Medal for his pioneering PhD research. That research, supported by the Natural Sciences and Engineering Council of Canada, helped establish GPS as a tool for studying the ionosphere, including its role in what we now call ‘space weather’. Dr. Komjathy says he's happy to now have the opportunity to give something back to UNB. In his new position, he will have the opportunity to mentor current UNB graduate students. "I feel I owe a lot to UNB and the department, so I'm very excited to help in any way I can."